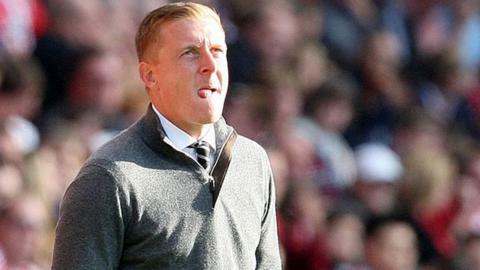 Garry Monk's Swansea have won only once in the Premier League since August. Swansea City manager Garry Monk believes speculation about him facing the sack is caused by people outside the club with an "agenda". Monk, 36, accepts his job could be under threat if the Swans do not soon arrest a run of one win in nine games. But he does not think Saturday's game against Bournemouth is pivotal to his future. Asked if it was a make or break match, Monk replied: "No, not for myself. I don't live my life like that." He added: "If I spent my time worrying about those things you wouldn't be able to do your job. "Of course I've been disappointed with some of the things which have been written. A lot of it has been irresponsible. "I think it's people trying to take things out of context and having an agenda behind it." Having lost five of their last eight Premier League matches, Swansea have slipped to 14th place in the table, five points above the relegation zone. Monk spoke to chairman Huw Jenkins after the latest loss to Norwich, but the manager insists the conversation was not a significant one in terms of his own future. "I have a great relationship with Huw. We have regular communication all the time," he added. "What you've learned from management in recent seasons is that, if you don't pick up results in a short space of time, your job can become under threat. "But I don't need anyone to tell me that. No-one has told me that, so it's just a case of focusing on my job." While Monk's future has been under scrutiny, so too has the position of his assistant manager Pep Clotet. The Spaniard is on the shortlist to become Brentford's next permanent manager, though the Championship club have not yet made an official approach. "To be honest I wasn't surprised by the speculation because of the calibre of coach that Pep is," said Monk. "Having worked so closely with Pep, he's been incredible for me. "He's as fully committed to his job and this club as I am. We've discussed the speculation, but it's nothing other than speculation." If Clotet was to leave, former Swansea and Liverpool assistant manager Colin Pascoe has been linked with a return to the Liberty Stadium. But Monk, who was coached by Pascoe during his time as the Swans' captain, says there are no plans to reappoint the ex-Wales midfielder for the time being. "He's a great guy. I know Colin exceptionally well," said Monk. "He was here the very first year that I came but, in terms of any links, I'm very happy with my staff."